This is not a bolt-on kit! This requires extensive 2-stroke engine building knowledge and should only be done by a very experienced engine builder. APS does offer these services, you can contact Steve @ 480-632-5565 for Pricing and Build Times. 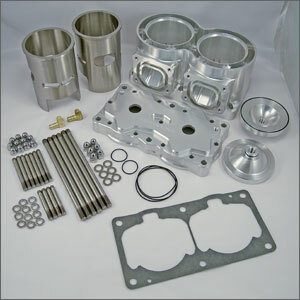 Billet cylinder kit for the Yamaha 701/760 engine. This kit is for use with a 76mm(+8mm) stroker(not included) with Kaw 750 rods(133mm/+8mm) and Sea Doo 951 pistons(not included). Bore size is from 89-91mm, starting sleeve rough id is 88.5mm. 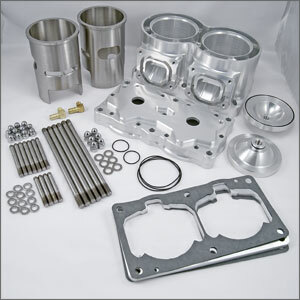 This kit includes billet cylinder, billet head, spacer plate, domes, sleeves(not installed), girdle studs, head studs, chrome acorn nuts, washers, orings, and gaskets. Cylinder will require finish porting by hand, installation of sleeves, and bored to fit desired piston size. Engine size with 89mm bore is 946cc, up to 989cc w/91mm bore. This kit is designed for freestyle and freeride applications, getting maximum engine displacement and allowing for low port duration for high torque applications.